How data and IT infrastructures have evolved – real-world examples of integrating legacy and modern data sources in finance, retail, healthcare, government, and more. 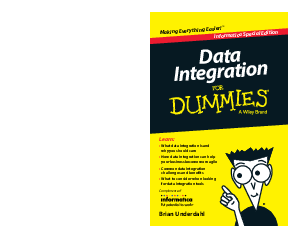 Data integration 101 – getting to grips with the terminology, how agile development fits in, and why hand-coding should be avoided at all costs. Understanding the key technical challenges associated with variety, volume, velocity, veracity, and value. Ways to address the important process issues, and recommendations for overcoming organisational and political roadblocks to data integration.